Spiti is a Buddhist area in northern India, close to the Tibetan border. This is an extract from our travel diary of walk through Spiti. There is only one road but side tracks lead up into the hills and walking between the high villages is a delight. A beautifully engineered new track to Demul winds up from the Spiti valley through honey coloured cliffs and emerges above the village at a small pass. The pass is marked with long strands of prayer flags that radiate from a white shrine housing a small gold painted Tara statue shrouded with a white khata scarf. Tara is a popular female aspect of the Buddha nature and there are many shrines, statues and painting of her throughout the Buddhist Himalaya. The pass is a delightful place and we stay for some time listening to the prayer flags slapping in the wind as we look down on Demul village sitting at the head of a lost valley, a thousand feet above the Lingti river. At the high call of an eagle we look up and watch it swoop down into the valley. The name Demul may have some connection with an old Tibetan word for yak. Demul is very close to the ancient Tibetan kingdom of Guge and legend has it that a Tibetan trader passed this way, came back a year later and saw that a tree had begun to grow from a seed fallen from the hoof of one of his yaks. He took it as a sign to settle here. This is the Gold Tara at Demul. 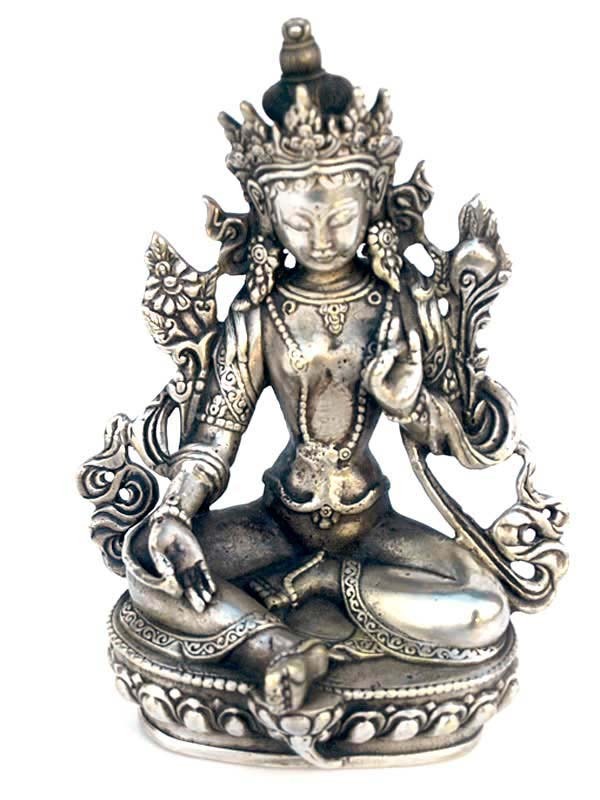 This second photo is of a beautiful silver Tara statue from Tibet which we bought in Ladakh. We've sold this statue but other similar Buddha statues are on our Buddha Statues page. Green terraces fall away from the village towards a ravine. As we descend into the gorge we pass women working the fields and an old stupa. The gorge narrows and descends steeply; high up on the opposite side narrow paths lead to a series of caves fronted with retaining walls, maybe shelters or meditation caves? We climb to another stupa next to a stream and rest for a while surrounded by the smell of wild mint.